If approached the right way, writing bylined articles for well-respected publications can help establish your reputation as having expertise in your practice area. Here are some practical ideas to increase the effectiveness of this marketing strategy to build your practice. Most law firm marketing experts agree that bylined articles are an extraordinarily effective way to establish your reputation as having expertise in a particular area of law. For best results, your article should appear in a well-respected publication read by people who have the decision-making ability to hire and refer you. As with most effective business development activities, some time and effort will be required on your part to make the most of a great writing opportunity. Therefore, you should be selective about the writing opportunities you pursue or accept. Here are some things to consider to capitalize on your upcoming writing engagement. The last thing you want is to spend countless hours on a literary masterpiece that no one will print. Therefore, before you even think about lifting your pen (or sitting down at your keyboard) there are several important things that you need to do. Be clear about your purpose. Of course, the ultimate objective of your article is to build your reputation in a particular area of law that will generate business for you and your firm. But, give some thought to your primary purpose for this particular article. Is your primary purpose to build relationships with people at a particular organization, enhance your reputation as having expertise in an area of law, or increase overall visibility with a key audience? Once you determine your primary purpose, you can then incorporate some of the ideas presented here into your strategy. Determine who you want to reach and the publications they read. Give careful thought regarding who you want to reach with your article. Then, find out the publications they read and respect. This enables you to identify the publications for which you want to write an article. com Jremsen TheRemsenGroup John Remsen Jr. is president of TheRemsenGroup, an Atlanta-based marketing consulting firm that works exclusively with law firms nationwide to help them attract and retain clients. He is past president of the Southeastern Chapter of the Legal Marketing Association and is a frequent speaker and author on law firm marketing topics. Readers can subscribe to TheRemsenReport. Get to know the editors. Once you have figured out the publications you want to go after, schedule a meeting (or telephone call) with the editor to find out more about the publication, its editorial calendar, and its guidelines for article submission. Be clear on the parameters (length, style, deadlines) for your submission. Ask the editors about topics in which they have a particular interest. Editors are always looking for timely, well-written articles for their publications and you are likely to be surprised about how receptive they can be to your call. Be sure to ask for a media kit, if available. Now might also be a good time to discuss reprinting policies and copyright issues. More about that later. Also, by talking to editors, you are also building important relationships with them. Who knows when they might be looking for a quote from an attorney on a particular legal issue? Get a commitment before you start to write. Before you commit to spend the time it will take to write your article, get a tentative commitment from at least one worthwhile publication that it is likely to include the article in an upcoming issue. Be clear on the topic, the length of the article, and submission requirements. Now that you have determined your audience, selected the publication(s), and discussed potential topics with an editor or two, you can get to work on writing your article. Stick to the parameters. Be certain to stick to the publication's parameters for bylined articles. An article that is too long or submitted after the deadline stands a good chance of not being published. If you run into problems or have any questions, let your editor know as soon as possible. Write for your audience. Write to your audience's level of understanding. Avoid using "legalese" or writing in a style not easily understood by your readers. Keep in mind that many magazines are written to the reading comprehension level of a sixth grader. For a good overview on writing articles and getting them published, see The Writer's Yearbook or a magazine entitled Writer's Digest. Focus on a strong opening paragraph. Hit your reader with a strong opening paragraph. Many readers will fail to get beyond your opening paragraph unless it catches their attention and compels them to read more. Have others proofread your final draft. At last you are done with your article. You have read and reread the final draft and are ready to send it off. But wait! Always have at least two other people (preferably members of your target audience or, better yet, a client) read it for clarity and relevance. Who owns the copyright? In most instances, the publication wants to own the copyright of the article, so any reprints or subsequent publication will require its approval. Also, if your work will appear on the Internet, there is a myriad of other copyright issues to consider. Ideally, you want to own the copyright so that you control decisions to reprint the article or the ability to shop it to other publications read by your target audience. Include a photograph and two-sentence description about yourself. Many publications will include your professional photograph if you provide one. Check to see if they will include it and, if so, ask how they would prefer to receive it - black and white or color, hard copy or electronic (and get specifics about file size, resolution, and format). If you provide a hard copy photo, be sure to put a label on the back and do not expect to get it back. Also include a two-sentence biographical profile about yourself. In many instances, the publication will include a brief statement about the author. If you don't write one, the publication just might and it may not include information about you that is most important. Determine in what format the editor wants to receive your article. The editor will really appreciate it if you provide your article in an editable electronic format (word processed, double-spaced). But, if you send the article in hard copy, include a diskette and do not expect them to be returned. Notes and letters. Send a note to the editor thanking him or her for the opportunity to contribute an article to the publication. In your note, let the editor know of your interest in future writing opportunities on other topics. Also, be sure to thank anybody who helped you with your article, including your proofreaders. Why not include a copy of the article as it appeared in the publication? Distribute reprints of the article to clients and others. Herein lies the true business development power of bylined articles. Get the article reprinted on good quality paperstock and use it as a handout at speeches and seminars. Include it with the firm brochure. Use it in proposals. Few things position you as having expertise in your area of law more powerfully than a well-written article in a well-respected publication. Send the article to clients, prospective clients, and referral sources and don't forget to include a brief handwritten note. (You should consider your state's bar rules and regulations on this subject.) 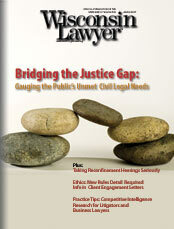 Distribute the article throughout the firm and encourage other attorneys to send it to their clients and friends. Display articles in your firm's reception area, along with other firm collateral materials. Future writing and speaking opportunities. Work with the publication to identify topics for future writing opportunities. Offer to be a resource for ideas, topics, and commentary for future articles. If you were writing for an association newsletter, ask about speaking opportunities at the organization's meetings and seminars. And if the group included decision-makers and represents an industry group important to your firm, join the organization and become an active member. Play it again, Sam. Chances are there are other publications that would be interested in the same or a similar article. If you control the copyright, send the article to other publications to see if you can get additional mileage from your writing effort. Promote yourself and you might be surprised by the result. Also, consider converting your article into a speech on the topic. Generate some post-event publicity. Now that you have been published, consider any publicity opportunities, both within the firm and externally. Maybe it's something you should add to your resumé or biographical profile. Strive to improve your writing skills. See if you can get some reaction from several individuals who read your article. Ask them what they thought. Ask if they have any recommendations to improve it. And if you really want to get serious about writing articles as an important part of your marketing strategy, consider taking a course on the subject.